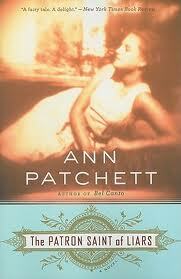 a book chick: "The Patron Saint of Liars"
"The Patron Saint of Liars"
my take: I tip my hat to Ann Patchett. ... This is the third novel I've read by her and it's completely different from the other two (which isn't always the case). Cousin Betsy said this was her favorite of Patchett's novels (Betsy was reading her way through all her work) so I had to try it. Patron is set in the U.S. in the 1950's with unwanted pregnancies the main subject. I cared for a couple of the characters, but not the main character, which, maybe, we're not meant to. Cold. fish. As with the other Patchett books, this is a submersion in a completely different time and place. Unlike her other books, she actually names the place and time. State of Wonder still may be my favorite, just because it was my first. my source: Cousin Betsy. Betsy knows books. Still have Bel Canto on my pile... so hard to get to all of these!